Is West trying to hurt Russia by driving Ukraine to default? RIR presents a selection of views from leading Russian media on international events, featuring analysis of the consequences of a Ukrainian default on its debt, as well as a report on the latest attempts to restart peace talks in Minsk on the future of eastern Ukraine. The Nezavisimaya Gazeta newspaper points out that Ukraine is speedily moving towards a default, which is part of the West’s strategy as its main victim will be Russia. According to Mikhail Delyagin, head of Russia’s Institute of Globalization Problems, leading Ukraine into bankruptcy is a deliberate policy by the West. “A default will make it possible to obtain Ukraine’s assets at minimal prices or maybe even free of charge: the energy system, the gas transportation system, ports, mineral deposits. 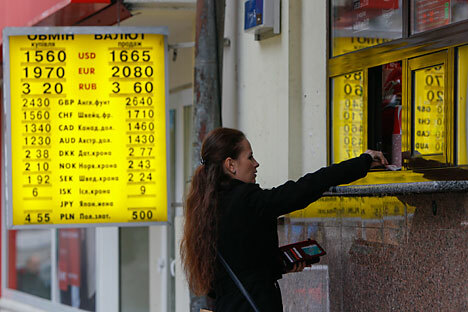 Russia will surely write off Ukraine’s huge debts, while the West will do no such thing,” says Delyagin. The Kommersant business daily reports that the next round of the Minsk talks on the resolution of the conflict in the Donbass region of eastern Ukraine is now due to be held by the end of the month. During a videoconference, both sides, the Ukrainian authorities and representatives of the self-proclaimed Donetsk and Lugansk people’s republics in the east, have confirmed their readiness to continue a dialogue that has come under threat of a complete collapse. The presidents of Belarus and Kazakhstan have also joined the mediation efforts. However, the warring sides fundamentally differ on the main purpose of the peace process: Kiev seeks to restore its sovereignty over the country’s east, while Donetsk and Lugansk seek conditions for creating independent state institutions. It is worth noting that during the videoconference, the two sides refrained from the traditional mutual accusations of breaking the ceasefire. According to a senior representative of the so-called Donetsk People’s Republic, Denis Pushilin, all sides expressed their satisfaction at how the truce declared with the OSCE’s assistance from Dec. 9 was holding. The sides’ latest steps towards each other are the result of active mediation efforts undertaken recently by Russia and the EU, which are not interested in a further escalation of the conflict in eastern Ukraine. President of Belarus Alexander Lukashenko, who recently visited Kiev, has joined in these efforts. On Dec. 22, Kazakh President Nursultan Nazarbayev will be visiting Kiev too. This expansion of the list of intermediaries to include leaders of the former Soviet republics that are among Moscow’s closest partners improves the chances of resolving the Ukrainian crisis.